Remember the old-fashioned plug on the end of a chain that you used to put into the plughole? Many of us regard them as unsightly and inconvenient. Unsightly, because the plug’s got to be put somewhere on or in the sink when it’s not in use, and an ugly lump of rubber or black plastic detracts from what could otherwise be a beautiful bathroom. Plus, of course, the chain traps hairs and collects limescale like nobody’s business – and has to be attached somewhere, unless you’re going to leave it dangling uselessly, getting in the way when you try to put it in the hole. Inconvenient, because – well, who of us hasn’t caught an overly shortened chain when washing and pulled the plug out by mistake? That’s why more and more people are turning to pop-up plugs – the ones operated by a handy knob-topped lever behind the taps which you pull up when you want to stop the water running out of the sink, and push down when it’s time to get rid of it down the drain. Unfortunately, it’s a bit more complex to remove the pop-up plug altogether when the need arises. But it should still be well within the capabilities of most people – in fact, provided your pop-up design isn’t too esoteric and some over-zealous installer hasn’t over-tightened things, you may even find you don’t even need any tools. 1. Locate the vertical pushrod A that passes down from above the sink. Somewhere along its length you should find a locking screw D which connects that rod to the vertical linking strip C. Slacken the locking screw. 2. 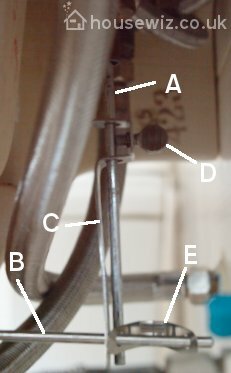 Remove the spring-clip E that holds the linking strip C in position on the pivoting rod B by squeezing the two ends towards each other and sliding it off rod B. 3. For reassembly purposes, make a note of which of strip C’s holes rod B passes through. You should now be able to slide strip C off the end of rod B, with a bit of manipulation. Now you’re ready to move to the next stage: removing the pivoting rod from the stopper. A word of warning here! 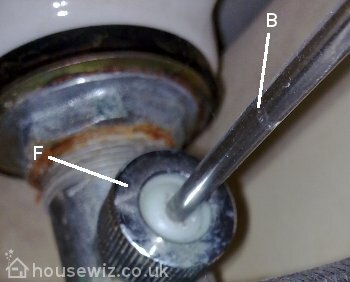 Before you do this, make sure that you shove something between the rim of the plughole and the stopper to make sure that the stopper stands proud of the plughole – otherwise you may well face a struggle to remove the stopper after you’ve taken the pivoting rod out. Look at the back of the waste pipe coming down from the sink. You should see that rod B runs through a ball joint held in position by a knurled ring (F). Undo the ring, then simply pull the rod out of the socket in the base of the stopper. You should now be able to remove the stopper from the plughole. Reassembly is simply a matter of reversing the process above. Hello. I’ve been successful at removing the pop up plug. Thank you. Do you have suggestions for what can be used in the gaping, ugly plug hole that remains when a standard plug is not in situ please? Many thanks for any insight and options you can provide.